One thing’s for sure – the xFyro ARIA made waves both when they were launched and after the campaign ended. They had tremendous success in their crowdfunding campaign, but they also had many setbacks that left backers without their rewards for a long time. This sparked outrage and claims of fraud, countered by claims of issues with customs. Knowing what really happened is almost impossible and beyond the scope of this review – but after a long wait, xFyro is finally sending out units, so the situation seems to look better. After I tried the xFyro xS2 I admit my expectations were not that high. My experience with the previous product was poor, and this was reflected in my review. The ARIA are thankfully much better than their predecessors. Disclaimer: the xFyro ARIA sample comes from the company, free of charge. They sell it on their website for $125. The xFyro ARIA concedes nothing to appearance, at least as far as packaging is concerned. The box is just plain cardboard and contains a cheap plastic tray which holds the earphones and the case-cradle. Getting them out of the tray is fairly difficult and requires a bit of patience, but is otherwise riskless. The box also holds a manual, an additional set of silicone bands and two additional silicone eartips (for a total respectively of two and three sets). 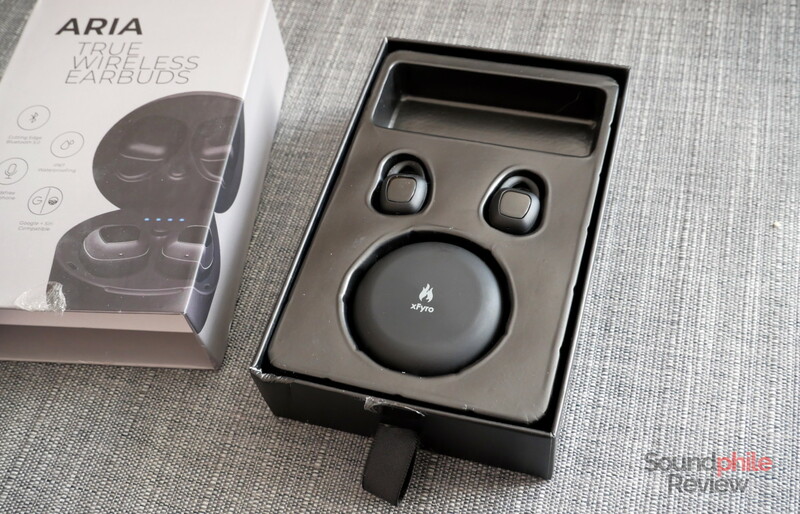 The packaging is nowhere near the level of finish other “true wireless” earphones at less than $150 offer, but it gets the job done. Just like practically every other “true wireless” headphones out there, the xFyro ARIA come in a box that acts both as a cradle and as a charging dock. The case is circular and small – it is just around 5.5 cm in diameter and 3 cm in height, so it fits in any pocket with ease (I’m looking at you, PaMu Scroll). The case is made of plastic with a “soft touch” finish – and while it feels great to the touch, it’s a fingerprint magnet. The interior is just matte black plastic. The lid closes (and stays closed) thanks to magnets. Once you open it, four blue LEDs indicate the status of the battery inside the case. There’s also a power button, the use of which I’ll detail later in the review. xFyro chose to keep the micro-USB connector instead of using a more modern USB Type-C one – I guess that has to do with the costs of the new connector, which is still quite expensive. They cheaped out on this a bit. The earpieces are almost squared, with a band made of rubber that encases them and a glossy button in place of the traditional faceplate. There is a status LED on the lower side. Two small recessed plates on the “back” of the earpieces, right beside the nozzle, allow for the charging of the battery – there are two matching pins in the slots of the case. Build quality is average, but nothing more than that. The xFyro ARIA do not look especially resistant nor refined. In fact they look a bit cheap, mainly because of the generic design and use of “soft touch” plastic on the earphones too. That may be a bias of mine, of course, but they don’t give me the impression of being a premium product. I can’t say they are not built well, though, because I can’t point to any specific flaw – it’s more of a matter of feeling than fact. 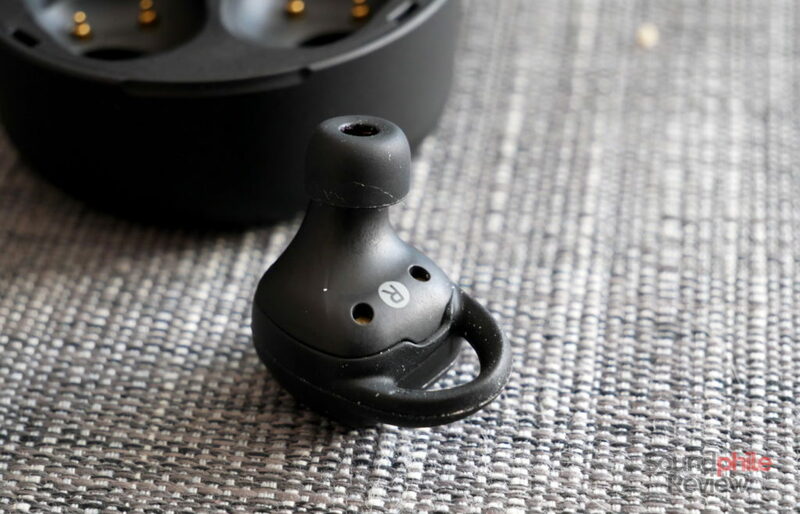 What annoys me the most is the feeling of buttons on the earpieces, as they are stiff and hard to press; I expected them to be a bit softer and more reactive to touch, as their behaviour seems more appropriate for cheaper products with little regard to user experience. Comfort is always a deeply personal matter. What works for me does not necessarily work for you and viceversa. But I have a few doubts about the xFyro ARIA not being comfortable for anyone due to their size being very large. In my specific case, the problem is that the shell is large and squared in shape, so the angles press against the pinnae and cause stress and, in the end, discomfort. This happens despite the presence of the silicone band around the shells, which should alleviate the issue. Even changing the band does not solve the problem. Another fact is that the earphones tend to get out of the ears easily, and that keeping them all the way inside the ears is hugely uncomfortable. Those two things are intertwined, as the difficulty to keep the earphones deeply inserted in the ears causes them to fall off easily. When pushing them in completely I feel as if there was a suction cup inside my ear: not only is that sensation unsettling, but it also makes sound plain terrible – all bass vanishes and everything sounds dampened. My guess is that this is caused by the lack of a vent. The only solution I found is to keep the earphones not completely inserted, so as to have a bit of air circulating. This also means isolation is almost null, of course. I do not know if this is a direct cause or is just correlated, but the fact is that the earphones then tend to further come out up to the point they almost fall off. Isolation is poor, mainly due to the issues I talked about previously. This may not be an entirely negative thing if we look at the ARIA as earphones made for an urban context, where hearing the surroundings can be fundamental for the safety of the the wearer (e.g. to be able to hear incoming vehicles). The only way I found to make isolation better is to use foam eartips, as those adapt better to the shape of the ear canal. The xFyro ARIA use the Bluetooth 5.0 standard which should allow for better sound quality and better range. There are limits to that, though. xFyro marketed the ARIA as being able to work when taking a shower or when swimming. While the earphones work just fine when showering, the swimming pool situation is just pure science fiction. The problem is that water is one of the best shields against electromagnetic waves. You can’t just leave the source (e.g. your phone) on the poolside and then swim with your favourite music as water would cut the signal and leave you without music. There’s no way around this; unless you can bring your source with you in water and keep it at less than 50 cm away, it’s going not to work (and I’m not entirely sure it would work even in that case). 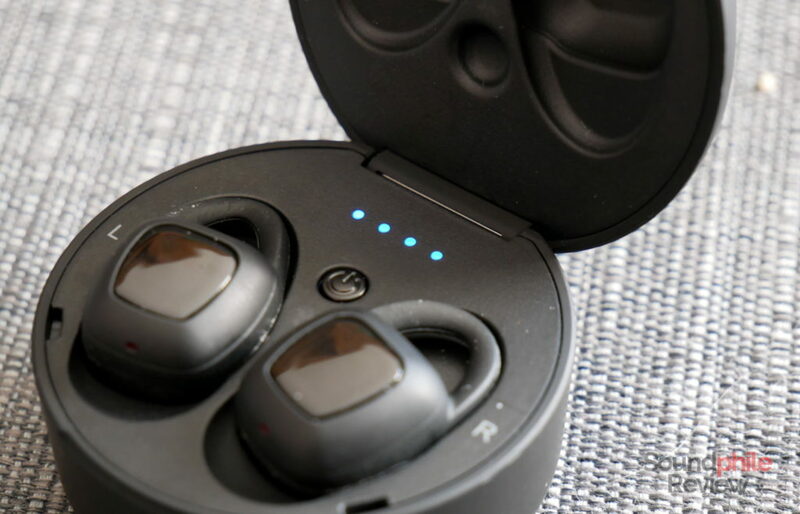 Again, they work flawlessly as earphones one can take a shower with, and they’re also great if you want to do sports with them as they are IP67 certified. The xFyro ARIA do not offer neither AAC nor aptX codecs on top of the standard SBC codec, so the sound quality will only depend on the latest Bluetooth 5.0 standard. It allows for better sound quality, but it’s still less than that made possible by more advanced codecs. 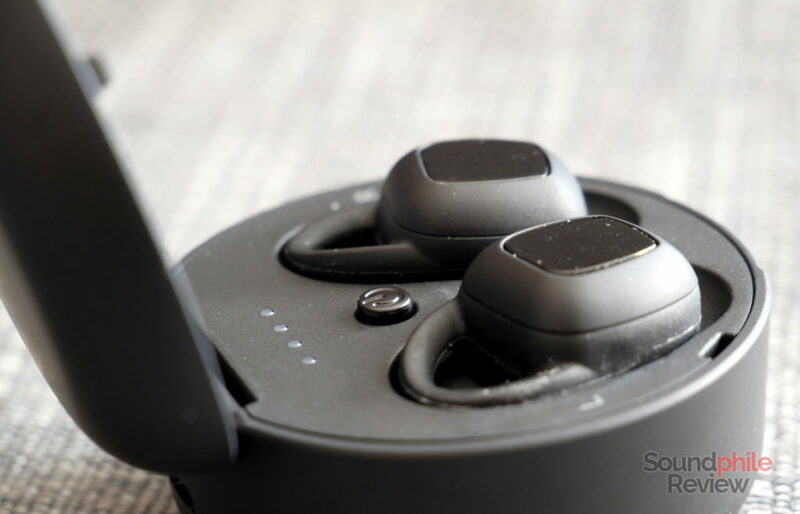 Contrary to many other “true wireless” earphones on the market, the xFyro ARIA do not feature touch controls, having traditional physical buttons instead. 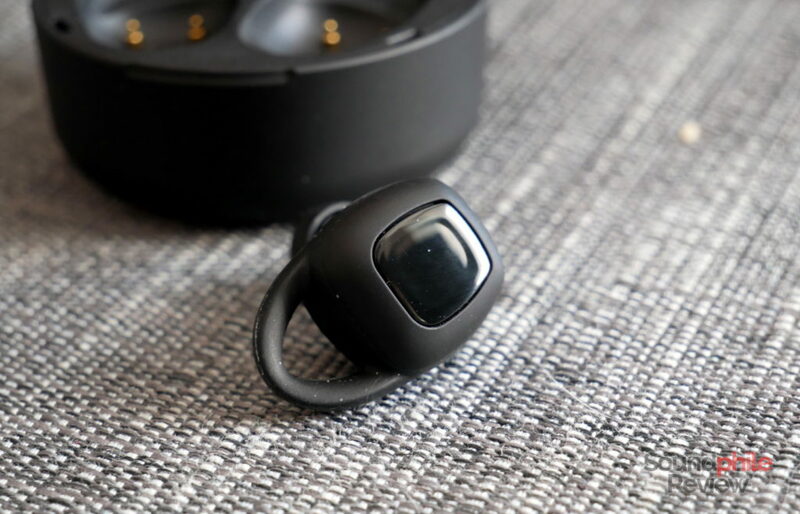 That choice has its pros, as you won’t have accidental touches registered as commands, but it has its cons, too, as pressing the buttons will make the earpiece push against your ear and cause discomfort. long click: previous track on the left, next track on the right. The microphone is decent at best; it works well in silent environments, but can only do so much in noisy situations. It always sounds like the voice is very distant and it’s not always clear, so the usefulness of the ARIA as earphones to take calls is less than one would expect. 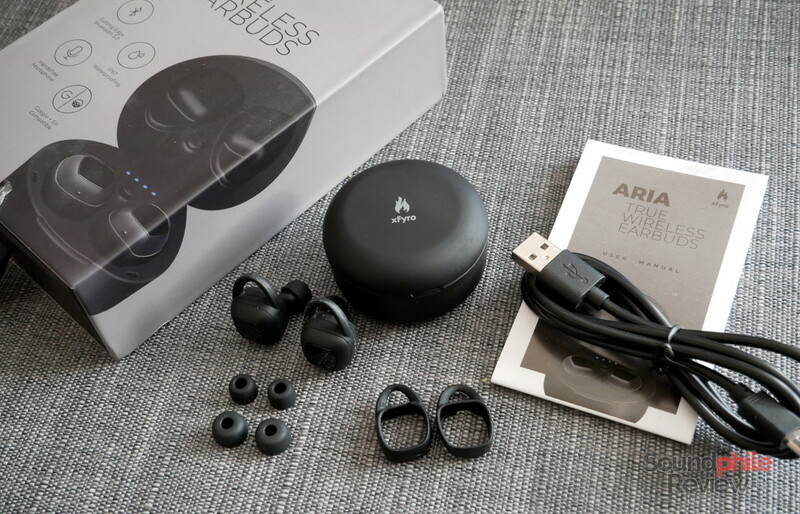 There is a case-cradle one can put the earphones in to charge, but the xFyro ARIA do not actually automatically power on and off when they are placed in or taken out of the case. The only way to make that happen is to leave the case with the power button on the “on” position, but this will drain the battery much faster. In terms of battery life, xFyro claims 8 or more hours of usage on a single charge. That figure is however not realistic: during my (admittedly long) time with the ARIA I was only able to get 4 hours off the battery, and only on one earpiece. There is in fact some inconsistency between the two earpieces which leads the right one to run out of power faster than the left one, so the right one will usually be without power after around three hours and a half with the left one still having 25% battery left. I do not know whether this behaviour is caused by an inconsistency in the batteries’ quality, a false reporting on the amount of charge left or in the fact that the right acts as a bridge between the source and the left one and therefore drains battery faster. Either way there is a problem. Another issue is the fact that xFyro promised a mind-blowing 8 hours of battery life during the Indiegogo campaign these launched with. Reality is, as I’ve stated, well different. xFyro of course knew about this as the real battery life is well below what’s advertised. The fact that the real thing is half the promised thing leads me to believe they knew this and used the advertisement to deceive potential customers. It happens all the time, but the way it was done is ridiculous. I mainly used a Honor 9 smartphone to try the xFyro ARIA, but I also used an xDuoo X10T II. All source files were FLACs in standard resolution. The sound signature is unmistakably “mainstream”, and by that I mean it has a strong emphasis on mid-bass and midrange and treble sit behind the lows. It’s not Beats-like, in the sense that many of their headphones tend to only have bass and to have highly recessed midrange and treble. It’s still a strong emphasis on bass that make it predominant. In terms of technical ability, the xFyro ARIA are unexpectedly not bad at all. Of course they’re still limited when compared to wired earphones in the same price bracket (and that would include my all-time favourites the RHA T20i! ), but they are not as bad as one would think given their “true wireless” nature. Soundstage is limited in width and especially in depth, but is still wide enough not to sound compressed or squashed. Imaging is limited, so it won’t provide much more than basic spatial clues. Instrument separation, too, is limited but capable enough not to make the music sound like a blurb of mashed sounds. 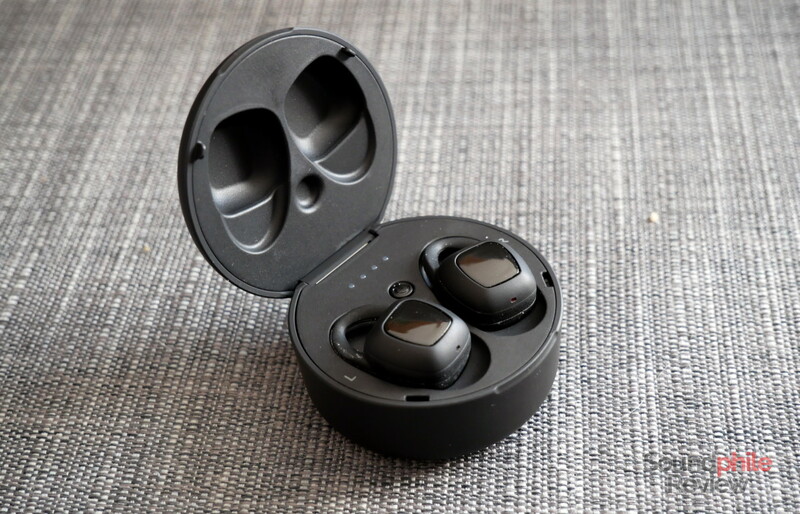 Bass has some unexpected depth and punch – I expected nothing like that from “true wireless” earphones. I believe that most of this is due to the DSP modifying the frequency response of the drivers heavily, as they’re actually really small and therefore not really able to produce much bass unless forced to do so. Even with this forcing in place, depth is still relatively limited – the ARIA reach down to “just” 50 Hz with good presence, and below that mark there’s a steep roll-off curve that leads to inaudibility soon. Bass is not really detailed anyway: it can barely keep up with two different instruments such as double bass and kick drum – if double bass is playing, you won’t be able to hear kick drum clearly (as you can hear on Roberto Olzer’s Stee-vee). Bass is not tightly controlled and therefore it can’t keep up with fast transitions or multiple lines playing at the same time. It’s more of a fill in the lowest part of the spectrum that gives body to the rest of the sound. It’s okay for casual listening, but not much more. Fortunately it doesn’t leak over mids, so at least there’s that. Midrange is warm and recessed, in line with the general sound signature of the earphones. The lower midrange is emphasised and confers a distinctively warm touch to the signature. Midrange is otherwise unremarkable, being almost dull sounding. Detail is moderate at best, also because of the relatively slow speed: transients have long decays which lead to a loss of detail. Despite the use of a large dynamic driver, there’s no feeling of impact nor any physicality to the sound, which is a bit disappointing. Treble is recessed compared to bass and roughly in line with midrange. Highs are not really present and are often sitting behind, so they get masked by the rest of the sound unless they’re already in the foreground in the track (e.g. in Roberto Olzer’s Vocalise). Extension, too, is somewhat limited and therefore takes depth and air away from the sound as a whole. In terms of detail it is just barely sufficient, as it can only retrieve the most apparent details – the smaller nuances are lost. All in all, I would say that the xFyro ARIA would be good for casual listening and for modern genres. They surely scratch the itch for bass-heavy signatures and they’re ideal if you want to just drown in the atmosphere of tracks such as Skulls by Royksopp. 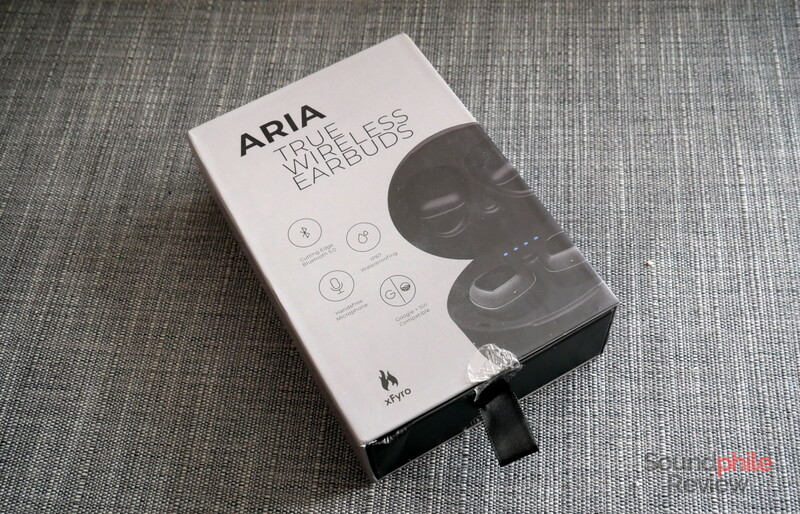 They’re definitely not perfect, but from an acoustic point of view the xFyro ARIA are among the best “true wireless” earphones I have tried (which, by the way, speaks volumes of how the “true wireless” earphones generally sound). They’re definitely nowhere near being in audiophile territory, but they are decent – something that I can say about few products on the market right now. They’re a good compromise if one wants sufficient audio quality while also keeping the convenience of a “true wireless” setup. Now, if we look at them exclusively from an audiophile standpoint, they are nowhere near being competitive against the wired alternatives. Any wired earphones half the price of the ARIA crush them in terms of sound quality. That’s to be expected, though, and it is true even for “true wireless” earphones from brands much more famous than xFyro. Considering the good amount of features of the xFyro ARIA, I think they are worth checking out as they unexpectedly come out as good competitors to other similar headphones on the market. Be sure to keep your expectations in check, though. Plenty of great ear buds out there from companies that don’t treat you like sh** once you’ve paid. If you are in the USA, they are having issues with customs. I’m not saying this to defend xFyro, it’s just a fact – multiple sources are telling me the same, so that’s indeed true. As for the fact that they need to get better at customer support, I totally agree with you.